The spacecraft joins four geostationary Earth orbit (GEO) satellites launched previously, which will be incorporated into an eventual Compass system of 5 GEOs and 30 MEOs, according to reports from the China news agency Xinhua. 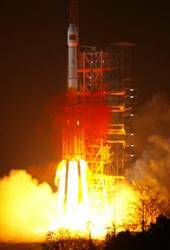 A few days earlier, China had overcome difficulties with the most recent GEO launched February 3 and indicated it was successfully in place. Chinese sources say the system is expected to provide services to customers over China and neighboring countries by 2008, before being expanded into a global network. The carrier rocket, a Long March 3-A, blasted off from the Xichang Satellite Launch Center in China’s Sichuan Province and was reported to have “accurately” entered its orbit at a height of about 13,300 miles. The GEOs are located about 22,000 miles above the Earth. Xinhua cited “sources” as saying China is willing to cooperate with other countries in developing its satellite navigation industry to allow the “Compass” system to operate with other GNSSes. However, to date, those talks have apparently not begun.